At the January 31, 2019, meeting of the Pacifica Foundation’s National Board, Executive Director Maxie Jackson centered in on the core problems as the organization fights for survival. After speaking with representatives of the Corporation for Public Broadcasting (CPB), Jackson told the board via a conference call, that Pacifica must change its system of governance. The elections Jackson was referring to are at the heart of Pacifica’s governance system. Members elect other members to serve on committees that make decisions big and small. Most of the people that are chosen have no experience in the operation of radio stations or the creation of programming. But they do have opinions – lot’s of them. 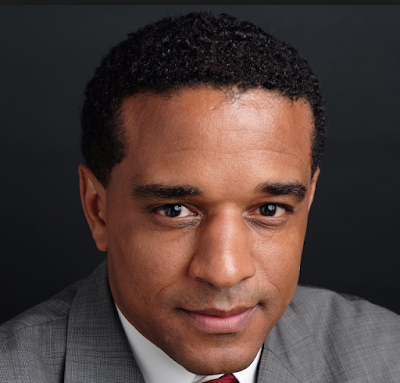 Jackson: The tragedy is that, when I go around to the stations and talk with the staff, I have yet to meet a person who says the board serves them in any way that is productive. In other words, the mind-numbing number of internal committees have created a situation where the people who actually “make radio happen” are micromanaged to the point of where creativity is impossible. Jackson: We have a track record of poor financial management at the station level. If you go and look at the CPB documents as far back as 2012 [it] is really clear in the report is that all five stations mismanaged their reporting of their finances. Jackson recommends that Pacifica change its governance system from top the bottom. Specifically, CPB’s advises that Pacifica change all of the internal committees into advisory groups, not governing units as they are now. Then, reorganize and increase the decision making power of the national board. This will likely be a tough pill for many Pacifica members to swallow. Several members of the current national board attended the meeting “under protest.” They like current "illusion of democracy" that empowers people like them to become mindless knit-pickers who enjoy screwing things up for the fun of it. KEN SAYS: We are truly impressed with Jackson’s analysis of the situation and actions he is recommending. For the good of radio, we hope he succeeds. Duncan Lively, Director of Programming at KCLU based in Thousand Oaks, California, has a tough assignment: Compete and win in two markets against KCRW and KPCC with a small percentage of their programming budgets. 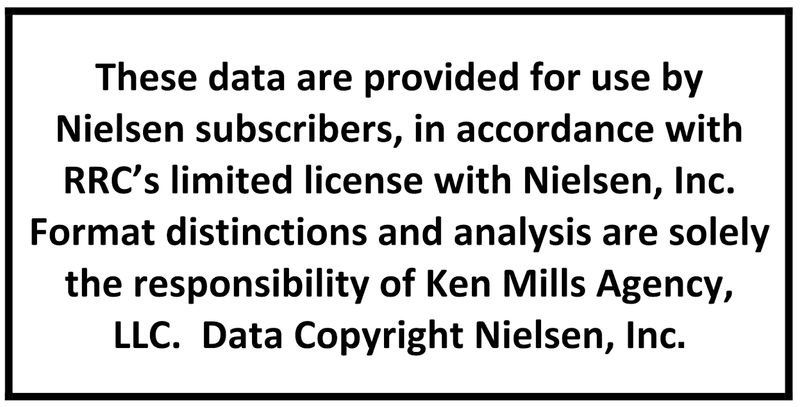 In the Fall 2018 Nielsen Audio ratings KCLU has done that again. According to Nielsen, KCLU has more AQH listening and weekly listeners in Oxnard-Ventura and Santa Barbara than the competition from LA. KCRW and KPCC (plus Classical KUSC) have full-power repeaters in both markets. But, KCLU is the top station in these two exurban markets. 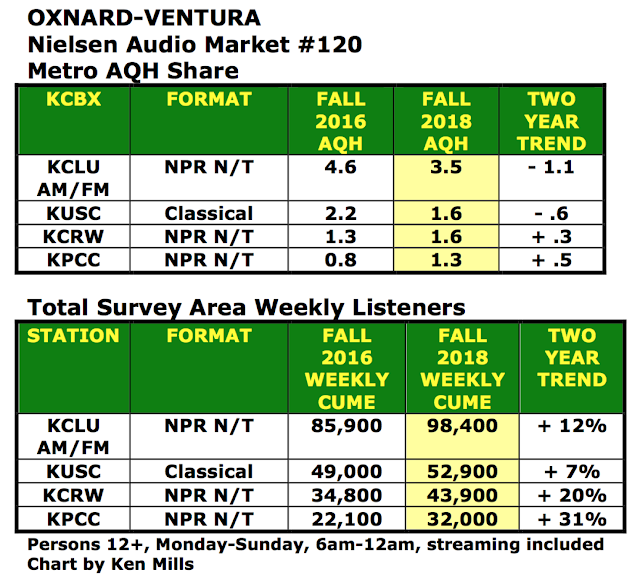 In Oxnard-Ventura, the bigger of the two cities, KCLU had 98,400 estimated weekly listeners, up 12% from Fall 2016. 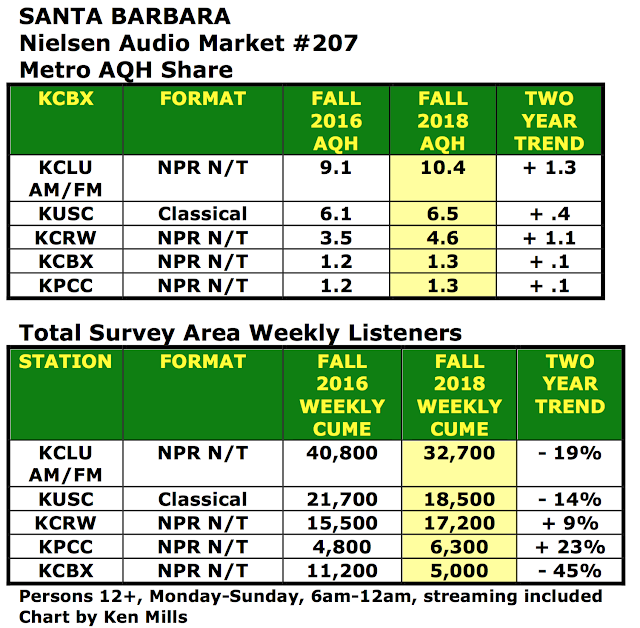 KCLU fell a bit in AQH share, but still leads KCRW and KPCC combined. It was a similar victory in next-door Santa Barbara. KCLU increased it AQH share to 10.4%, up from 9.3% in Fall 2016. KCLU’s estimated weekly listeners were down 19% but KCLU beat three NPR News/Talk competitors. 2018 has been a challenging year for KCLU and residents of the two communities. Terrible wild fires scorched portions of the beautiful landscape and took-out one of KCLU’s translators. The fires may have done considerable damage but the spirit of residents and the station are stronger than ever. I always knew Duncan lively was the best! Jackson’s “analysis of the situation” is not that impressive. It’s been obvious for a long time - but is also not the full story. While there’s no dispute for me that the boards, who do have ultimate authority, have been overwhelmingly destructive since 2002, the flip side is that the stations’ management is not blameless for the damage they’ve done. The stations’ were also enabled by the poor financial controls at the national management level. Getting “talented” people on the boards is not as easy as it sounds. There have been good people but they are driven away by the various bad actors who have gotten inside and continue to corrupt Pacifica. What is impressive is that Jackson is not afraid to tell the board what CPB said and whose opinions he seems to agree with. We’ll see how it all goes and pass the popcorn, please.